When Yeshua told the parable of the Good Samaritan, he used the imagery of a man traveling from Jerusalem to Jericho falling into the hands of bandits. Left for dead, his only hope was for a fellow traveler to notice and have pity on him. His first hope was from a Kohen (priest), whose duty was to minister to the LORD on behalf of the children of Israel. His piety would have been assumed by Yeshua’s audience, and he would have been the naturally anticipated hero to the story. However, as we know, the Kohen passes him by without stopping. Yeshua next introduces a Levite, one whose duty was similar to the Kohen, but functioned more like an assistant to the Kohanim (priests) in the Temple. Surely, he would stop and help this man who was struggling for his life. But no, the Levite passes him by and continues on his way just as the Kohen. At this point, Yeshua’s audience was surely shocked that neither the Kohen nor the Levite turned out to be the hero of the story. But before we discuss Yeshua’s surprise ending to his parable, we need to try and understand why Yeshua would have had both the Kohen and the Levite pass up this poor man struggling for his life. Why did both the Kohen and the Levite pass up the dying man? According to this passage in the Torah, a Kohen was to keep himself himself ritually pure at all times. He could not make himself impure even for a relative, except for his immediate family. The restrictions for the Kohen Gadol (high priest), however, were even more stringent (vs. 11). Why does the Torah seem so lacking of compassion in regard to the Kohanim? It is because they were the ones who performed the daily functions of God’s Holy House, and they served as mediators between God and all of Israel. We also have to keep in mind that once a person was exposed to corpse contamination, the purification process would take seven days to complete (Numbers 19:11). Their service was critical for the entire nation, therefore it was important that they maintain their state of ritual purity so that they could perform their service in the Holy Temple at the proper time. Although we are not told which direction the Kohen and the Levite were traveling, if they were on their way to Jerusalem, rather than returning from it, their state of ritual purity would have held great significance. As we can see in this example, human life had taken a back seat to ritual purity. During the first century, the concerns of ritual purity had even extended to the common Israelite. Rabbi Simeon ben Eleazar noted this through a comment recorded for us in the Talmud saying, “Come and see how far purity has erupted in Israel!” (b.Shabbat 13a). Maybe this “outbreak” of ritual purity had extended to the Levites during the first century, and was the reason for the Levite passing over the victim in Yeshua’s parable just as the Kohen. Maybe both the Kohen and the Levite were unsure if this man was dead or alive? And if he was alive, could he be kept alive long enough to be put into someone else’s care before dying and transferring impurity to them? They decided to not take a chance and crossed to the other side of the road so their state of ritual purity might be preserved. Whether their decision was due to indifference or ritual purity, their own concerns had taken precedence over human life. Although Yeshua’s listeners were shocked and waited in disbelief for the hero of Yeshua’s story to be revealed, in the back of their minds they understood the implications of what was left untold. Are we catching the implications of Yeshua’s teachings like they would? 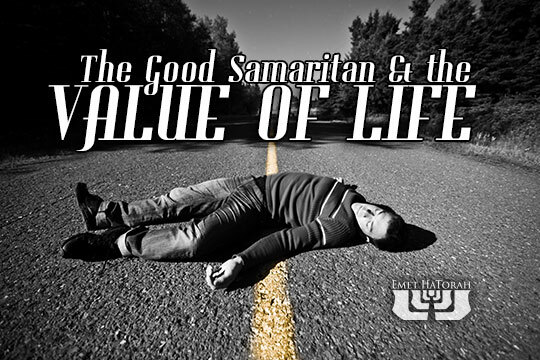 Next week, in Part 2 of The Good Samaritan and the Value of Human Life, we will continue exploring other facets of this parable as we unravel its implications for disciples of Yeshua today.